Code Clan Week 8 - Android - Like putting your pants on two legs at a time! So Im at the halfway mark (Trumpets and fireworks) 8 weeks down and 8 weeks to go. 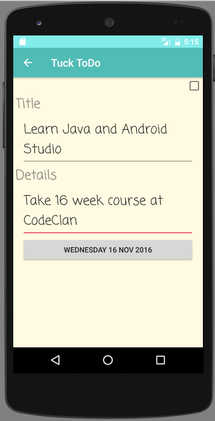 This week was the second full project week and the task was to to create an Android App on Android Studio and Java. 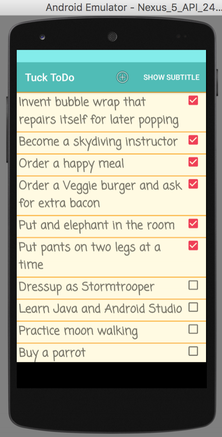 The task I picked was to create a basic ToDo list. Simple in principal when you have pen and paper, but gets hard when you want to program it in Java, and even harder when you add in Google Android operating system. No matter I set about the task on the previous Friday and planned out a basic application in a used case diagram and imagined what classes I would need to create. I had been given some notes on how to use list views so put them into practice making a very basic application. I wanted to add more functionality and have the ability to save any tasks created into the app. I had been recommended a book called Android the Big Nerd Ranch, so after a quick look on line it found its way into my Kindle. Monday I spent my time adding Java functionality and getting to grips with fragments and adding to a basic app. Tuesday I added SQL lite and made my data persistent and saved it to memory. Wednesday I spent the day playing with Androids equivalent of CSS and messed about with how the App would look, changing colours, fonts and adding a splash screen. Thursday was big presentation day where each Cohort had 15 minutes to demonstrate their project and explain how they had coded it and discuss how they got on. The Presentations were brilliant again and it really is amazing to see how novice programmers can produce working apps and be able to talk all the jargon in just 8 weeks.